Years ago I kept notes in Yahoo! Notepad. I believe the last time I reviewed these notes was probably ten years ago, until tonight. While looking through the list, my eyes were drawn to the note "Carson & Barnes 5 Ring Circus." The content of the note, which I wrote after taking my daughter to the circus, was an itemized list of things I thought could be applied to business and marketing. Many years later, these ideas still seem viable. 1. Always have action going. At a recent business meeting, there were several presenters, but frequently, pauses occurred during the transitions between presentations. Additionally, some of the presenters let their talks lag in the middle. This is not just a problem in presentations, but also often occurs in drafts of books. The characters maintain action up to a certain point before the author can figure out how to propel them forward to the end of the book. Within a speech or presentation, action can be maintained by featuring co-presenters or changing modes of presenting every few minutes. If multiple presenters are scheduled in succession, have a producer or host to keep events moving. 2. Have something for everyone. At the circus, acts in each of the rings were designed to appeal to different audience segments. While one act might feature acrobatics designed to impress adults, a clown might be presenting in a different ring. The circus also had a center ring, for the main action, and two rings with less impressive acts. 3. Have the next act ready to go. In this modern age of instant access and continuous information flow, even though many complain about receiving too many inputs, people don't like pauses or outages. I once attended a presentation where the presenter had the wrong slide deck. We had to wait 15 minutes for her to retrieve a USB drive from her hotel room. 4. Give the people an offer they can't refuse. 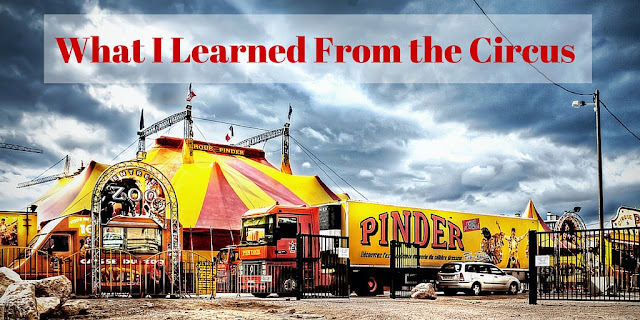 The circus has mastered sales by setting prices low ($1.00 for a bag of peanuts) and using associations to elicit memories for parents and create memories for children. The circus offered coloring books for $1.00 delivered by clowns. When presenting, think in terms of what your audience wants. Make associations and use metaphors and analogies to connect your content to previous memories and experiences. 5. Open big and finish big. The circus started with a fantastic display of many acts rotating in and out of the rings. It ended in similar fashion. The circus was memorable because of so much action. By starting your presentation with a compelling story, fact, or incident and ending in similar fashion, you can increase the likelihood your audience will remember what you talk about. At my daughter's school, senior students are expected to deliver a 30-minute speech. One student started with a story which illustrated the points of her talk. Another student just jumped right in to his points. A week later, I could only remember the one speech, because I could recall the opening story. Title image created in Canva. Photo credit: Yan Renucci "Pender Circus"